50% OFF for Early Buyers! Spanish Sports Bingo. Regular price $3.95! Thanks for following us! Your feedback supports our store and helps us offer these special discounts! Save time and have fun in class with this unique Spanish version of Bingo with Sports graphics and high frequency vocabulary. Gamify your class and teach these high frequency words with our twist on the classic Mexican game La Lotería. This Spanish version of Bingo is better than the normal game with special features like game twists, extra points, and special calling cards. These games teach more than just the twenty targeted words. Teach your students the art of defining words in Spanish (circumlocution). Use our full sentence clues to call out the DEPORTES words and provide tons of comprehensible input (CI). Extend your lesson plans with a student note-taking sheet and vocabulary quizzes. Play as a teacher led activity or in centers! 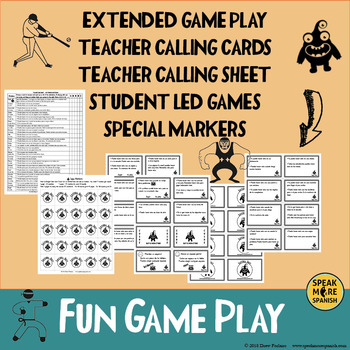 BIG BOARDS (full page boards) so even your youngest students can play. Easy-to-read print and fun graphics make these games great for any age. Teacher led or student led options for game play with unique calling cards for each. NOTE: We opted for high frequency verbs when possible. For example, we choose words like NADAR instead of natación and montar a bici instead of ciclismo in the belief that students were more likely to use those words in every day speech. The teacher can always supplement with their own words by reading different definitions. 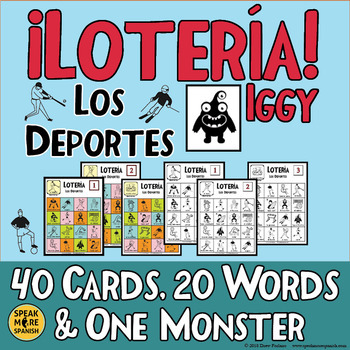 Forty Unique Lotería Iggy Cards with color graphics with bright colors. Each Card has 16 words and one monster. The game uses 20 words total so players won’t always have the word on their card when called out. 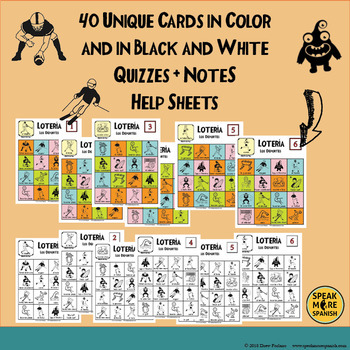 The Same Forty Cards above in Black and White for easy printing. A Teacher Calling Sheet with multiple clues. Mark off up to five rounds per sheet. Teacher Calling Cards: These contain the clues with an English/Spanish SENTENCE definitions of each word. Use these instead of the calling sheet if you prefer. Use the Specialty Cards with this deck if desired. These are great for circumlocution and comprehensible input. Student Calling Cards: These contain sentence clues in Spanish. The word itself is not used and no English is provided. The grammar structure may be changed so students can practice a different conjugation. Use these cards to play the game in centers. Students pull the cards, read the clues and decide on the definition together. See next page for more instructions on how to play. Iggy Marker Chips: Print, cut and use as markers for the boards. Print one per board. Have your students cut them for you before playing. 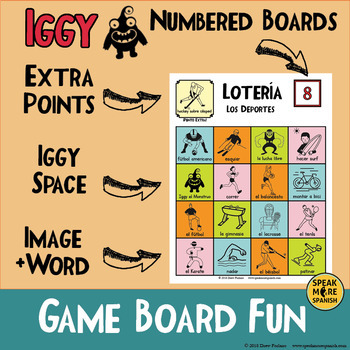 Keep the chips to use on any other Lotería Iggy sets you may have purchased! Print on card stock for a more durable finish. One Visual Vocabulary sheet with all 20 words. Each word has an associated graphic. Students write the word in Spanish below. Use this as a note-taking activity, pair exercise, or quiz. Two Matching Quizzes: Two 20 word quizzes with Spanish and English definitions. One quiz has 20 words with 25 options. The other quiz is easier with just 20 words with 20 options. Each quiz has a unique order of words so you can use one or both. Differentiate in class by using both quizzes at once (give easier ones to students that need more help) or do the easy one first and use the difficult one another day for review. Student Help Sheet: This sheet has the entire list of the deportes vocabulary in Spanish and English. It also includes game expressions and any target structures used for defining vocabulary. Print, cut and distribute to players if they need more help! Color PDF Slides with game vocabulary: Project these in class to demonstrate the game concepts or special vocabulary items. Leave one projected on the board while playing for easy reference. A Free Link to a Matching Quizlet list with the DEPORTES vocabulary. ❤️ Spanish Bingo Vocabulary for Poder and Infinitives. La Lotería para Vocabulario. ❤️ La Lotería para Las Navidades. Vocabulary Game for Christmas Bingo in Spanish. ❤️ La Lotería para El Día de San Valentín. Spanish Bingo for Valentine's Day! Check out all our BUNDLES! Lecciones y recursos para aprender el vocabulario de los deportes, uno de los pasatiempos populares. Juega con Iggy el Monstruo. Juegos para los estudiantes de Español.